Annette’s leaf is placed at Angeline’s. If you have memories or photos of Annette, please post a comment. April’s leaf is placed at Angeline’s. If you have memories or photos of April, please post in the comments. On Monday, January 5 , at 6:30 a.m., the body of longtime Hammond House shelter resident Dolores Beamon was found in a Seattle parking lot. While the cause of her death has yet to be determined, it has been theorized that homelessness, poor health and the snowstorm that had brought the city to a virtual standstill all contributed to her sad and unexpected demise. Fifty-four years old at the time of her passing, Beamon was born and raised in the Seattle area and is survived by her mother, her siblings, and many nieces and nephews. View more about Angeline’s Day Center here. 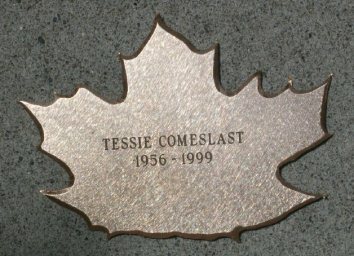 Tessie Comeslast, friend to many in the homeless community; died on August 14th, 1999. She was Flathead, from St Ignatius, Montana, and was a powerful, compassionate woman. She is survived by two of her three sons and at least one grandchild. Tessie died of complications of pneumonia, at a friend’s house. She had a prescience of her own death: earlier in the year she’d seen the owl, and gave some of her hair to her friend Kim, telling her to burn it in the traditional way. A memorial service to “raise up her name” was held at Angeline’s Day Center. Michelle’s leaf is placed at Angeline’s. If you have photos or memories of Michelle, please post a comment. According to her friend Janna, Sharon Kilgore had a very difficult life, with many difficult things surrounding her. She did her best in an often impossible situation. In spite of all the odds against her, she kept a sense of humor, black as it may have been. In a video Public Service Announcement for the Church of Mary Magdalene, Sharon spoke up to solicit donations of brassieres for their “Ministry of the Lingerie:” “You never know when you might have to go to a funeral, baby,” she said, and then laughed her beautiful laugh. She used to call all of us younger women, “baby girl.” She was a tough mom figure to many, and will always be missed. Sharon’s leaf is placed at Angeline’s. On the streets, where last names are seldom important or even known, Dinah Lane was often called Dinah Shore. Although both these Dinahs had strawberry blond hair and amazing smiles, you couldn’t imagine someone less like the sunny 1950s television hostess and singer than Dinah Lane. She was a homeless activist, a striver for justice, and was always reading thick tomes from the Public Library. She engaged for hours in intense, thoughtful conversation about the government, systems and conspiracies. Robin Langston was strangled to death in the alley off Third Avenue and Blanchard Friday, September 15, 2000 at 4 a.m. Late in the afternoon that day I walked down the alley, just after I’d gone to a police briefing about the murder. Leaf of Remembrance for Ella Lewis, being cleaned May 2013. Ella’s leaf is placed at Angeline’s. If you have memories or photos of Ella, please post a comment to share them. Melody’s leaf is placed at Angeline’s. If you have memories of Melody to share, please post in the comments. Tonya’s leaf is placed at Angeline’s. If you have photos or memories of Tonya, please post a comment. Sarah’s leaf is placed at Angeline’s. If you have photos or memories of Sarah, please post them in the comments. Renee’s leaf is placed at Angeline’s. If you have memories or photos of Renee, please post in the comments.